This course covers automatic temperature and humidity controls, space pressurization controls, safety controls, and energy monitoring and central supervisory control systems for heating, ventilating and air conditioning (HVAC) systems. The control system shall be a complete, reliable, fully functional, maintainable, fully integrated, addressable, control system that has been properly designed, installed, and commissioned. In existing facilities, the design shall be integrated and interfaced into the existing control system so that the new equipment and conditions can be controlled and monitored similar to the existing controlled equipment. 9. GAS-FIRED AIR-HANDLING UNIT CONTROL. Learn about fire and smoke protection controls on HVAC systems. This course is intended for mechanical and electrical engineers, and other design and construction professionals wanting an introduction to energy efficient control systems for HVAC systems. This course will give engineers and others an introduction to controls for HVAC systems that will allow for their efficient and cost-effective operation. 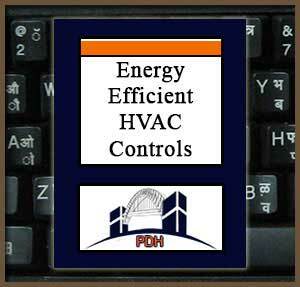 This is an introduction to the control devices, systems and features that will permit energy efficient operation of heating, ventilating and air conditioning systems in buildings. After completion of this course you will have an understanding of control systems that will allow you to design energy efficient HVAC systems for buildings.